The coaching industry is an interesting industry and depending on who you talk to, there are some interesting and different perspectives you that might surprise you. It’s assumed that coaches are supposed to be successful if they are to make (you) their clients successful, but that isn’t always the case. Coaching is a popular “side line” career: Life coaching for many people seems to be a means of generating some extra income in addition to their main career. Some of them feel that having a main career at which they are successful will help lend some credibility to their claim of being a good life coach, while others say it only takes the focus away from the main goal of building up one’s practice. Long term dedication: Most life and business coaches indicate that it takes quite a long time to build up a client list that’s reliable enough to generate a full income for them. Coaching does not earn much: Most coaches earn far less than advertised. An International Coach Federation (ICF) survey conducted in 2003 found that 70% of coaches earned less than $50,000 annually and 37% less than $10,000. While some coaches do well, the ICF study indicated that only 10% of them earned $100,000 and those were coaches to America’s Fortune 500. This study also showed that close to 100% of the survey respondents were primarily engaged in one-on-one coaching rather than group sessions. Whilst these figures are dated, they provide a clear snapshot of the coaching industry revealing that in the coaching world, a minority of individuals enjoy the lion’s share of earnings. Some coach training companies state on their websites that paid clients are guaranteed after their training and that life coaching is a highly paid profession, but it clearly isn’t. Small client base: Life coaches are struggling to get clients. One coach claims that being on the front page of Google brings in 3 or 4 inquiries irregularly and 50% of those inquiries are either time wasters or people who need therapy as opposed to coaching. In terms of demand for the services of a life coach, Google suggests there is actually a decrease in the demand for life coaching services as indicated in the graph below that shows a slight downward trend since 2004. So the fact that thousands of new life coaches have set up businesses with the online demand remaining static, which is pretty amazing considering how online users have grown from 745 million in 2004 to over 2.1 billion in 2011. Mathematically, it shows a significant decrease in demand for life coaching services rather than growth. In 2013, IBISWorld estimated that the 3 largest companies account for less that 0.5% of the coaching industry revenue which means the business coaching industry is highly fragmented with a large number of small businesses operating. The majority of companies service only their local areas and represent about 91.1% of companies in this industry. Sole proprietors generate only 12.8% of the industry’s revenue. No Governing body for coaching: The coaching industry has no governing body to look out for the client, because there is no regulation. Life coaching is an unregulated industry. A governing and regulating body does not exist for Life coaching as it does for social workers and psychologists. The International Coaching Federation is a sort of self-appointed body that tries to bring some standards and structure to the industry, but primarily in the U.S. The coaching industry in Australia has been making strides in regulating the industry. The Australian effort has been underway for more than four years, but presents a massive challenge to coaches who have paid little attention to the emerging definition of coaching—and the “benchmarks” that clients may quickly adopt as the standard. 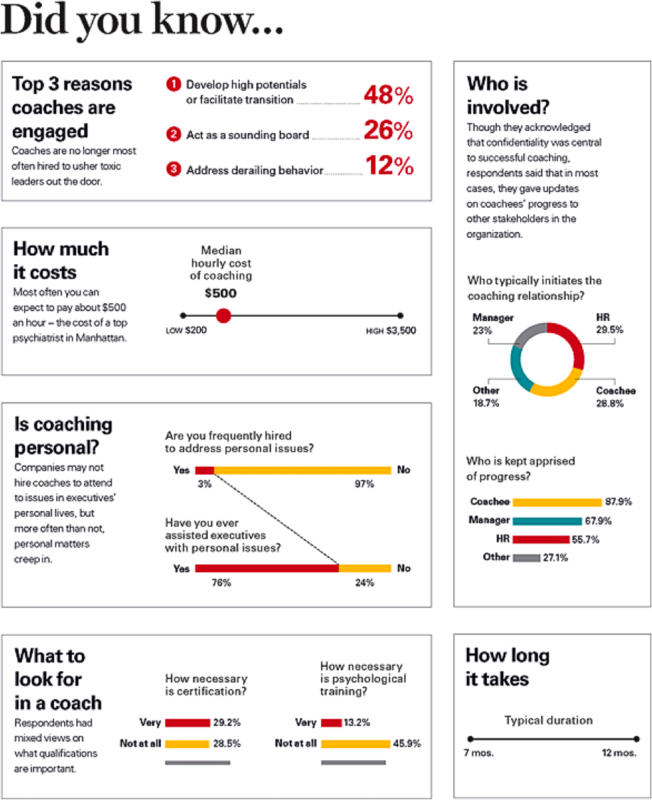 Harvard Business Review survey: The Harvard Business Review in 2009 conducted a survey of 140 leading coaches and got 5 experts to comment on the findings. The commentators all had conflicting views as to where the field is heading and ought to be heading; this reflected the contradictions that came to light among the respondents. It was commonly felt that the bar needed to be raised for the industry to mature. Ten years ago, life coaching was all about helping to fix toxic behaviour but today it is more about developing the capabilities of high-potential performers. This in itself has created more fuzziness around issues such as how life coaches define the scope of their work, how they measure and report on progress and the credentials a company should use to select a coach. Survey results show that the industry is fraught with conflicts of interest, blurry lines between what is the province of coaches and what should be left to mental health professionals, and a lack of mechanisms for monitoring the effectiveness of coaching. The bottom line is that coaching continues to grow but the fundamentals of the industry are still in flux. Life Coaching Myth: some, but certainly not all coaches are able to help you reach your goals. One of the main issues is that anyone can call themselves a professional coach, life coach, personal coach, etc. Coaching is not regulated and many ‘coaches’ have no idea what coaching really is because they haven’t been trained or haven’t been coached by a professionally trained and credentialed coach. There are schools that will offer a credential after only three hours of training! Some people read a book or watch a TV program and decide “I’m a coach!” as a result the quality of coaches vary dramatically. The purpose of this article is to bring to light what many business people don’t know – MOST life coaches and business coaches are worse off and less capable than the people who are hiring them! Streetsmart Marketing and Streetsmart Business School were born out of the real life challenges that the Founder Ian Marsh experienced building 5 multi million dollar companies. Over the last 17 years Ian Marsh has learned what to do and what not to do to build a successful company. That is why most of his companies have done at least $8million or more per annum . This puts him in the top .7% of Business Owners in the western world. He has distilled the systems he has used to build these companies into a structured process that he teaches in his Streetsmart Business School and uses his Extensive Knowledge of marketing to create effective lead generation and sales systems for his students in a done for you and a done with you manner. The amazing success of his students prove the power of his strategies and his goal is to help Create financial and Lifestyle freedom for serious business owners in 3-5 years or less.